Looking for a fun breakfast ideas for kids? Make rainbow pancakes for kids! 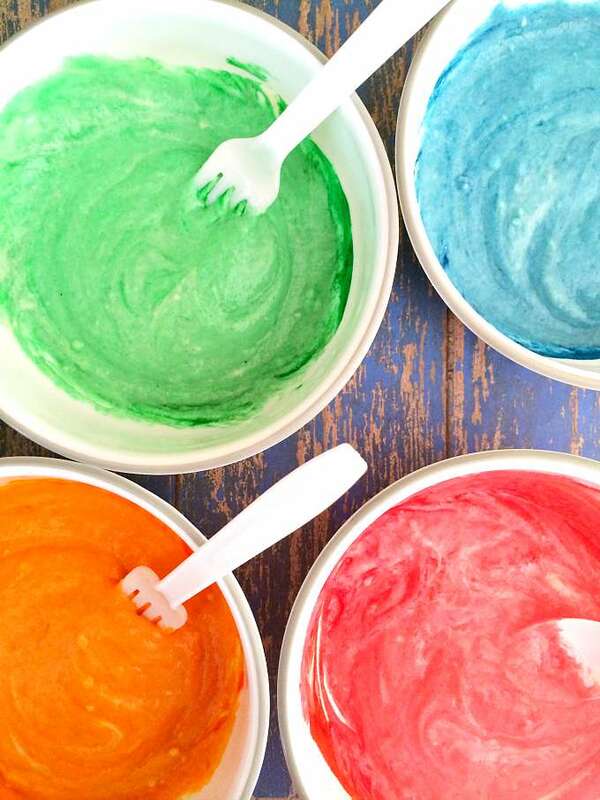 Your favorite pancake batter is died a rainbow of colors for a fun and colorful meal. Pancakes are a special treat around here. We make red velvet pancakes, Elvis pancakes, gingerbread pancakes, pancake pops – you name it, we've probably tried it. 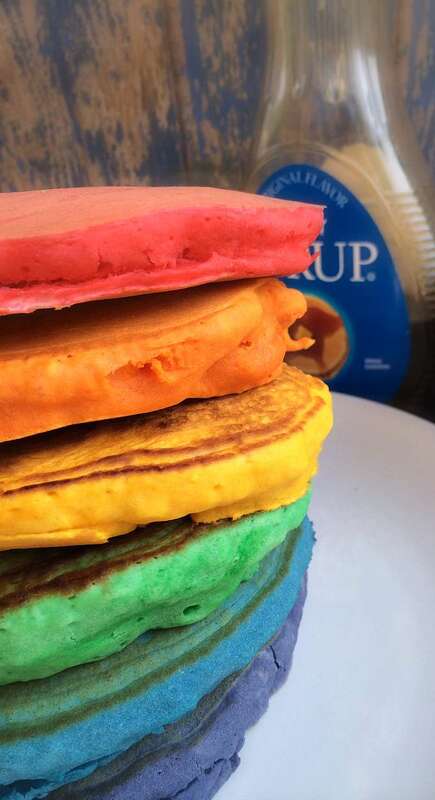 So these rainbow pancakes fit right in with this crowd. 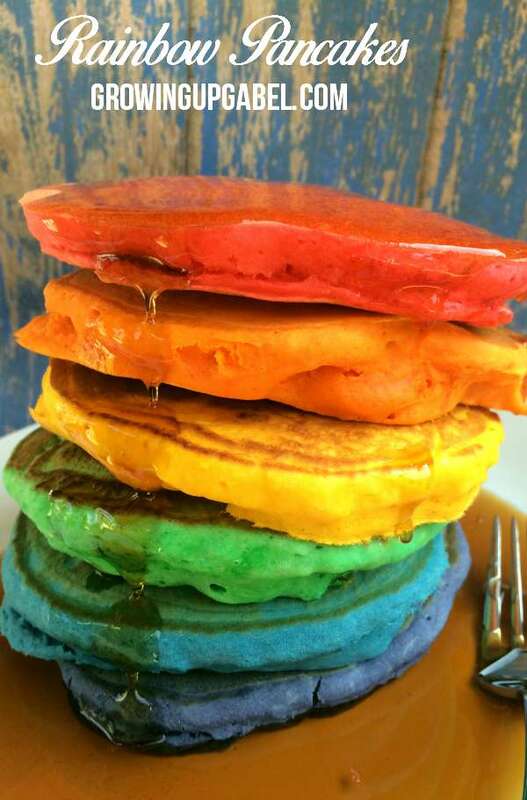 So why not rainbow pancakes? Use your favorite pancake recipe or a mix and some food coloring to make a truly colorful breakfast! This breakfast recipe is so easy to make. Start by making your favorite pancake batter. It can be from a box, a homemade mix or from scratch. This recipe was made with a box mix. Next, Divide the batter in to 6 separate bowls. Make sure you have someone around to do the dishes! Add a different color of food coloring to each bowl – red, orange, yellow, green, blue, and violet will get you a true rainbow. I find that gel food coloring gives the most vibrant colors in food. Switch things up by making neon or pastel pancakes! Makes sure to use separate spoons to mix each bowl so the colors don't get mixed up. Cooke the pancakes as directed in the recipe or on the box of the mix. To keep from browning, you can cook on a lower temperature or reduce the sugar in the recipe since sugar promotes browning. Each bowl will most likely make one pancake depending on your recipe. You'll end up with one rainbow stack. If you need more, just repeat the process or make a double batch of batter and make 2 pancakes of each color. Serve with your favorite pancake topping! We like maple syrup, but buttermilk syrup is ah-mazing! These would make a super fun first day of school or a birthday breakfast. Mix together your pancake mix per directions on the box or recipe. Separate your mix into 6 different bowls. Make sure someone else is around to do the dishes! Add one food coloring (red, orange, yellow, green, blue, purple) to each bowl and mix. Use a greased pan or skillet to cook your pancakes. Each bowl makes 1 pancake. Makes 6 pancakes - 1 of each color. Stack with purple on bottom, then blue, green, yellow, orange, and red on top. Top off with a little butter and maple syrup, buttermilk syrup or homemade whipped creamand enjoy! What a delightful idea! I will make these on St. Patrick’s Day! I love your Rainbow Pancakes, for big and little kids! Thanks so much for sharing your awesome recipe with us at Full Plate Thursday. Hope you are having a great day and come back to see us real soon! Great idea to add the colors! Thank you for sharing with us at Funtastic Friday! The only thing that can make pancakes better is having fun, colorful pancakes for breakfast! Thanks for linking up with Merry Monday; I’m featuring your rainbow pancakes at this week’s party, which goes live Sunday night. Hope you’ll stop by and link up again! What a cool idea. I know the kiddos would love rainbow pancakes. Thanks for sharing this fun food at DI&DI. What a fun idea! Thanks for sharing on the What’s for Dinner Link up! These are great for St Patrick’s Day and then your pastel idea is great for Easter. Done and done! Thanks for linking up at #SaucySaturdays. These are so fun! Like your blogs facelift btw! Looks so yummy! Wouldn’t these be fun for Fat Tuesday? Really darling. I wish my kids were little just so I could make these! Thanks for bringing this by Throwback Thursday! These are so cool! It’s my birthday next month, now I need to find somebody to make these for me! Super fun St. Patrick’s Day pancakes! My kids would love these. Visiting from Be Inspired party. who wouldn’t want to eat a rainbow? Thanks for sharing on the Creative K. Kids Tasty Tuesdays Linky Party. I hope you will join us again next week. My kids would go nuts with these!If I haven’t done so, I would love to invite you over at Blogger Spotlight Link and Pin-it Party! It runs every Thursdays, 7pm PST until Tuesdays, 7pm. We pin all the entries and you will be seen on five blogs. Hope to see you there! I’ve actually done a post like this too! 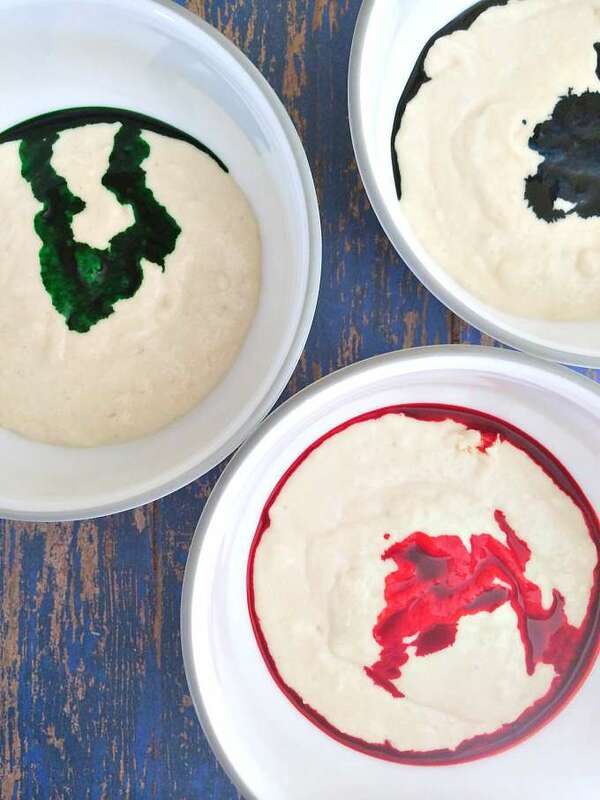 These are so much fun and easy to make…plus the kids ALWAYS love rainbow pancakes! Thanks so much for sharing with us at Share The Wealth Sunday! You always have such awesome posts! That looks colourfully interesting:)Such a cool idea. Loved it! Have a great Thursday! These look too good to eat! It’s almost like a work of art. Great idea! My kids will love this! Until they start fighting over a color! these are so much fun! Definitely cute for holidays or with little kids 🙂 thanks for sharing! 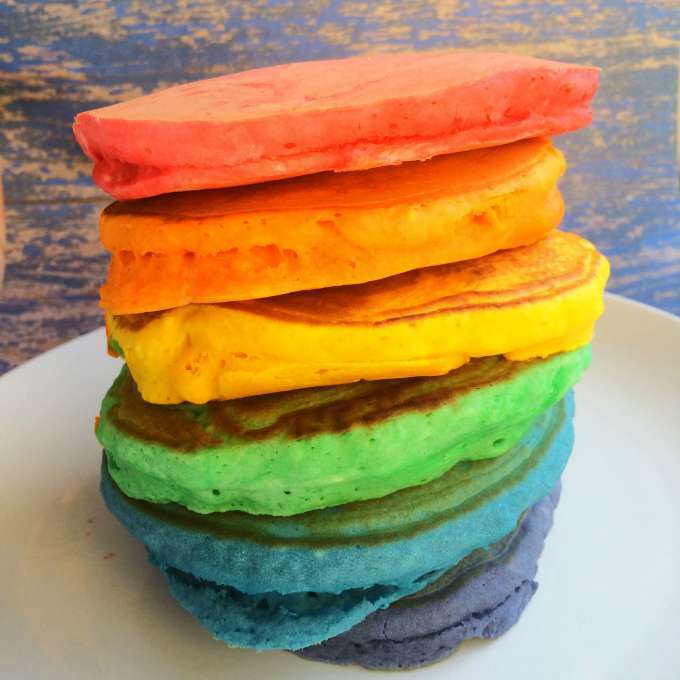 Hi Camille Thank you for sharing these wonderful-yummy Rainbow pancakes on the #OMHGWW. They would be wonderful for St Patrick’s Day and I would like to invite you to share them in my St Patrick’s Day Roundup-Link attached. So fun! Making sure you have a dish washer is the most important step! Pancakes are almost better than bread- almost! These look yummy! Could be great for a Rainbow themed party as well. These look awesome! I’m sure my boys would love them and would be great for party food too.